Today's topic will be a very fluffy one. Today I will tell you about one of my current 40k projects, the Cult of the Fifth Witch. I am not collecting an armyas such, I am getting a lot of models together and themeing them into a chaos cult. At the local gaming club I hope I can use these models all together, but at a tournament I shall have to use them in each separate army. So far the plan is to utilise parts of the Imperial Guard, Chaos Space Marines, Chaos Daemons and Grey Knights Codexes. I plan to write them all together in one 'codex', simply changing the titles of the special rules and such to give them a more thematic flavour. And now, without further ado, the background story to the Cult of the Fifth Witch. In some dark corner of an unknown Hive City on the planet Hygex lived Geralt Scipio, a scientist of great intellect but little renown. He happened to stumble across a book in his studies one day that looked extremely old and was written with some strange writing on the front. It was a mighty book, twenty centimetres thick, yet it weighed less than a kilogramme. Scipio was, of course, interested in the contents of this book and try as he might, he was unable to open it. After years of semi-focused study, he finally came to the discovery that this was a book of daemonic origins called "The Claws of Daemon Hands". He guessed it must be of some great power and, rather than turning it over to the inquisition, thought that he may be able to use the power within to better his research. Despite the book taking up more and more of his time, he was unable to discover it's secrets within hi lifetime, and so it passed to his trusted associate, Nearna Daela. She was also very intelligent but could not open the book. "The Claws of Daemon Hands" was yet to be opened, despite the efforts of Nearna Daela and her descendants, to which the book kept being passed down to. It wasn't until a gifted child, Pirella Daela inherited the book that the power within became truly apparent. Perhaps the book had chosen her, perhaps she happened to know how to open it, no one can be sure, but she certainly did open it. Upon the opening of the book and the subsequent study of it, Pirella Daela gained great powers of the Chaos Gods and was a master at bending them to her will. She called herself, the Fifth Witch, the unknown writer of the book being the first, Scipio being the second, her grandmother, Nearna Daela being the third, her mother Carlia Daela, being the forth. As well as being smart, Pirella was very well organised and, despite not knowing very much about military matters, was able to write up 'rules' on how to build an army, based around the books teachings. She wrote alot about "The Claws of Daemon Hands", partly translating it, partly simplifying it. Using the powers she gained from the book, Pirella was able to call upon forces that were unknown to even some of the more powerful chaos worshippers in the galaxy and called upon daemons and the warp to slowly and painfully destroy Hygex in 819 M38, in effect, by herslef. The Inquisition was, of course, organising Hygex's defence before it was destroyed. They in fact caught Pirella Daela and killed her. They destroyed Pirella's body, but realised that, despite it being an artifact of chaos, Pirella's notes, known later as the "Witches Cult" and "The Claws of Daemon Hands", were invaluable pieces of writing for use against chaos itself. 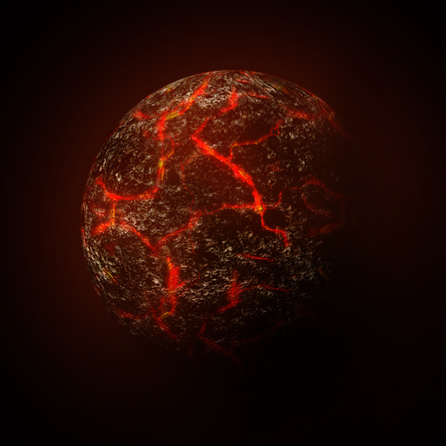 The Inquisitors left on the last evacuation ship, just as the last Daemons took over the planet, and set course for a base on Sirelon. Just as they were about to arrive on the planet, the ship was struck by a small asteroid, forcing the ship to crash on Sirelon, killing all the crew in a fiery explosion. The only things that survived the crash was the "Witch Cult" and "The Claws of Daemon Hands". An Imperial Guardsman, searching through the wreckage found them and sent them to his higher authorities. It found it's way to General Forn Pale, a military genius but some didn't trust him, thinking he was tainted by chaos. Whether he was or not, is really up for debate, but Pale certainly was after he came across the Pirella's belongings. He used her notes and the knowledge he gained from "The Claws of Daemon Hands" to form the Cult of the Fifth Witch, named after Pirella Daela herself. The Cult of the Fifth Witch is a very well organised chaos cult, as far as compared to others anyway, due to Pirella Daela's writings and Forn Pale's military experience. Each member of the cult, a cultist, is a member of one or more sects. There are no enforcements to be in a certain number of sects or be in any in particular. The sects are rather varied, some a militaristic warband, other almost a type of book club of those interested in the ways of chaos. Each sect ultimately takes care of it's own affairs, much like a small Space Marine chapter, though each sect is united under the doctrines laid down by Pirella Daela. Currently, the leader of the Cult (known as the Overlord) is Verna Xenith, a powerful warrior and a wise scholar of sorts. He oversees the four 'families' of the Cult, each led by a Baron. These families are made up of like minded sects that have similar ways or designs for the powers of chaos. 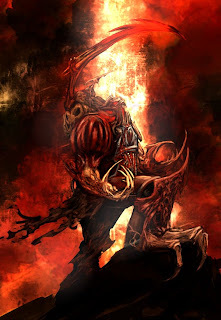 The families are as follows; the Arm Family, made up of summoners and chaotic priests, the Eye Family, dedicated to learning about and spreading the influence of chaos, the Voice Family, who are powerful psykers, though not necessarily in tune with chaos, and the Claw Family, the militaristic members of the Cult. Each family contains many sects, led by a Fanatic, each with their own thoughts on chaos, but all sharing the teachings in "The Claws of Daemon Hands" and the "Witch Cult". Each Fanatic leads a 'pack' of cultists, varying in number usually between five and thirty. The Claw Family is the largest and most respected family in the Cult and the most strictly and well led. Sometimes a Fanatic may gain such respect and power that when going into battle he leads other Fanatics like a general would lead Sergeants into battle. They each have their own traditions and insignia, but all look similar to an opponent. The Cult of the Fifth Witch is not an army, and probably never will be. It is a group of heretics sharing the knowledge and power of chaos. This means that, even when grouped together, they are not a huge force, though they are very powerful. Typically, a member of the Cult is a warped and possessed fiendish being, or a daemon dragged from the warp, willingly or otherwise. 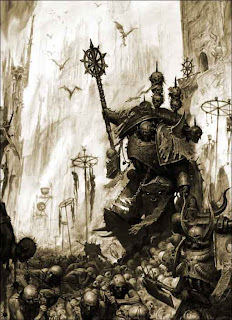 Many of the fallen hero's from the cult return to fight another day as lesser daemons or sometimes even daemon princes. The Cult is a sneaky force, often striking hard and fast then vanishing into the shadows. Under the direction of the Barons or the Fanatics, members of the Eye and particularly the Arm and Voice family join the Claw family in combat, lending their abilities or knowledge to a situation. This makes the Cult a varied force, and hard to truly plan against. The Cult has also spread to many planets, though each has few members residing there at one time. It is perhaps better to think of the Cult as a group of prophets, drunk on power and high on knowledge, fuelled by greed and armed with chaos, allies of the dark gods themselves. Well that is my current project. I don't really expect to win many battles, but it will be fun to collect. I plan to do alot of converting with this army and utilise new and interesting paint schemes. As you may have guessed, I love doing all this background stuff in Warhammer and I have always wanted to do a chaotic cult of some sort. Anyway, I hope you have enjoyed this post and I shall see you next time when I talk a bit about my current game design projects. so is the voice family the powerful psykers or are they the summoners and chaotic priests? You wrote Arm family twice when writing of the four families. Awesome post, very inspiring! 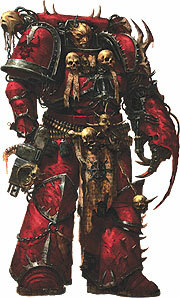 Most members of the Cult are psykers to some extent, some are very powerful. To reflect this in game terms, rather than using different rules I am just changing the wording. For example, if playing as IG, the Company Commander's "Fire On My Target" rule is renamed to "Hellish Ground", and in the fluff the Company Commander (most likey a Fanatic and his retinue) warps the ground at the enemies feet, forcing them to stand up and shift spots briefly, forcing your opponent to re-roll cover saves. The rules are the same, the fluff is different. Thanks for reading and picking up on that error too. I will post some more things about these guys when I have a bit of an army together.